If, like me, you’re using EM12c after you were already plenty familiar with EM11g, you may have missed an important detail in the EM12c new features guide. Each target now has a lifecycle status target property which can be set to one of the following values: mission critical, production, staging, test, or development. This target property is used to specify the priority by which data from the target should be handled. When Enterprise Manager is under a heavy load, targets where the value of the lifecycle property is mission critical or production are treated with higher priority than targets where the value of the lifecycle property is staging, test, or development. Setting the priorities of your most important targets ensures that even as your data center grows and the number of managed targets grows, your most important targets continue to be treated at high priority. You may not use some of the other new features like administration groups or lifecycle management, but it’s still very much worth your while to set the lifecycle status target property. After all, you’re more concerned about alerts and monitoring on your mission critical and other production systems than you are on the staging and test systems, so why not tell EM12c about that and gain the benefits of target prioritization? Oracle Enterprise Manager 12c Release 2. EM CLI client-side install completed successfully. Oracle Enterprise Manager Cloud Control 12c Release 2. Copyright (c) 1996, 2012 Oracle Corporation and/or its affiliates. All rights reserved. Once you have emcli running you can easily create files containing the target properties you would like to set, including the target lifecycle status, and apply them in bulk to your EM12c installation. 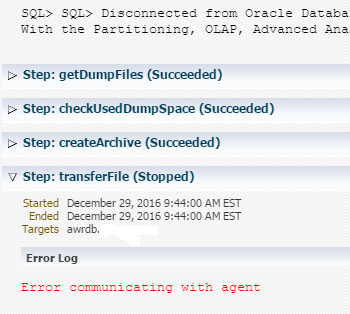 oracle@omshost$ ./emcli set_target_property_value -property_records="REC_FILE" -input_file="REC_FILE:/tmp/targets" -separator=property_records="\n"
There you go. Your hosts are now updated with appropriate target lifecycle stages and the OMS will prioritize them based on these settings whenever the OMS is under high load. Repeat this for your listeners (-targets=oracle_listener), database instances (-targets=oracle_database) and so on until all of your targets have a lifecycle stage assigned. I’ve broken these out by target type for simplicity of documentation, but you can also just produce a single large file containing the lifecycle status for all of your targets and load the whole thing at once. This same technique works to assign a contact, comment, location, or any other target property you find useful. This entry was posted in Cloud Control and tagged emcli, oms, upgrade on October 17, 2012 by Brian Pardy.